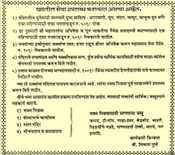 Shri Sant Gajanan Maharaj is known to most of the people in Maharashtra. He stayed most of his life at Shegaon, near Akola District in Maharashtra and has taken "Samadhi" there. Therefore Shegaon has got a special significance for Maharaj and his devotees. Shegaon hosts a magnificient temple. 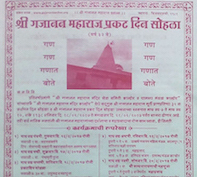 His devotees have constructed many temples in different parts of Maharashtra, India. A small -- but beautiful temple has also been constructed at Kanhor, Kulgaon, Badlapur, Dist. Thane. The temple is situated just outside of Badlapur village on a small hillock surrounded by fields and greenery all around. The enchanting natural beauty around the temple is another attractions for the devotees who visit the temple. We invite you to visit this temple and make this place more beautiful. Shri Sant Gajanan Maharaj Temple is reachable by State Transport Bus or Auto Rickshaws in 15 minutes from Badlapur (Central) Railway Station. This distance to the temple from Badlapur Railway Station is about 7 Kms. One can reach Badlapur by local railway from Thane, Kalyan or Chhatrapati Shivaji Terminus (Mumbai).